I had an epiphany in our Lenten Study. The way this year’s study works is that each week we read the assigned chapter in Brian McLaren’s We Make the Road by Walking, which always begins by directing us to that section of scripture to which the chapter is responding. This third week of the study directed us to the gospel of Matthew, chapter 6, verses 1-18. As you may remember, the lectionary calls us to read much of those same verses every year on Ash Wednesday. In particular, the part wherein Jesus commands us to pray in secret, give in secret, and fast in secret. We read that on Ash Wednesday. You know, the day on which we put a big ol’ mark on our foreheads? Totally conspicuous, obvious, and the farthest-thing-from-secret? That day? I’ve often wondered about that odd confluence. I’d say it strikes me as, well, hypocritical. Comically so, in fact. But in the process of reading those verses a few times, reading the McLaren chapter, and talking about all of it with the considerate folks in our study group, a new thought struck me: what if that dissonance is on purpose?!? What if the off-putting juxtaposition of that text and that public action is purposefully there to force us to face our own hypocrisy?? We read about praying, giving, fasting in secret then put that big mark on our forehead to show that we’ve prayed and then, quite often, talk about what we’re giving up for Lent. In other words, we often talk with each other about from what we intend to fast. I mean, really. If that’s not comedy, what is? Perhaps I’ve been too busy taking myself too seriously on that perhaps too-somber day to be able to laugh at myself. It seems so obvious now. It’s so over-the-top ridiculous, I have no idea how I never saw it before. We who claim to follow Jesus are so often also the same ones quite ready to call out the hypocrisy in others…maybe Ash Wednesday is supposed to help us laugh at our own hypocrisy instead. A physical embodiment of humility. After all, that’s exactly what comedy (at it’s best) is for: bringing down the haughty and lifiting up the lowly. What do you think? Could Ash Wednesday be the best kind of joke – one in which we literally wear our own hypocrisy on our foreheads, on purpose!? If so, why have I not noticed before now? Lent: that season of the church year during which millions of Christians prepare for the Resurrection of Jesus by giving up…something for forty days. Me? I’m giving up beets. Just like every year. In fact, as far as beets are concerned, I’ve observed a perpetual Lent for, oh, about twenty-five years now. Can’t. Stand. ’em. That’s my issue with the standard “give something up for Lent” approach: it is way too easy for it to become an empty ritual, a duty checked off, a way to feel “religious” without really challenging or changing yourself. Lent is a time marked by and for repentance, which means “to turn away.” A time to turn away from that which separates us from the Creator, creatures, and creation. (I know, I know. That formulation reeks of the cheesy, forced alteration so often employed by we preacher types. I gotta be me, I guess?) That kind of turning away could lead to giving up something like chocolate or coffee, depending on circumstances. But I suspect a list such as this one is much more likely to offer something truly worth giving up leading to actual change in our lives: fear of failure, guilt, destructive speech. It’s a terrific list. 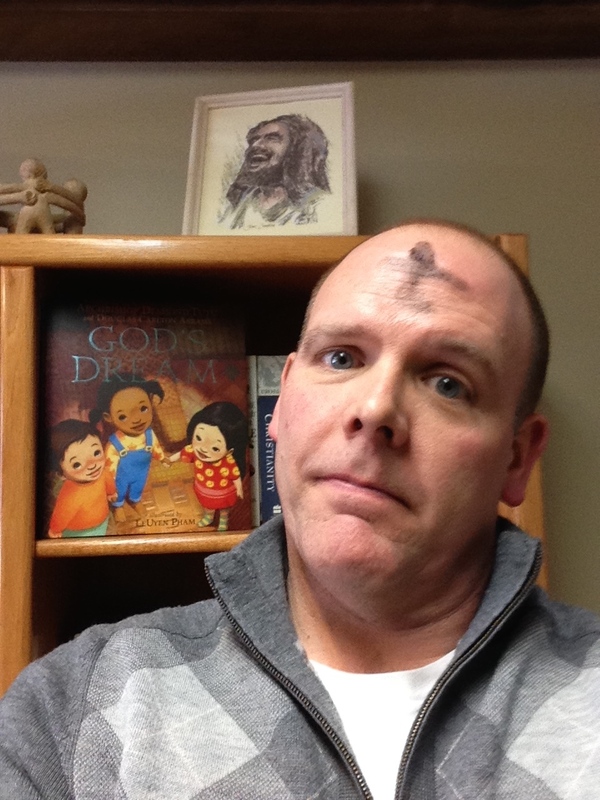 Whatever misgivings I may have about that particular Lenten tradition, I find Ash Wednesday to be very meaningful. Worship that day reminds us of our mortality (hence the ashes), is a call to repentance, and an opportunity for a restart. Though there is something ironic about reading Jesus’ words from the Gospel of Matthew calling us to “pray in secret” and then leaving the worship experience with an obvious, visible mark on our head. That’s a lot of forehead with which to work. Instead of giving something up, there’s what we might call an inverse tradition: taking something on for Lent. That is, committing to engaging in a spiritual practice (or similar) for the forty days. Hence, the annual Lenten Bible Study at Woodridge UMC. This year, we’re reading Brian McLaren’s We Make the Road by Walking. The title suggests that faith was never intended to be a destination, a status, a holding tank, or a warehouse. Instead it was to be a road, a path, a way out of old and destructive patterns into new and creative ones. As a road or a way, it is always being extended into the future. If a spiritual community only points back to where it was been or it only digs in its heels where it is now, it is a dead end or a parking lot, not a way. To be a living tradition, a living way, it must forever open itself forward and forever remain unfinished – even as it forever cherishes and learns from the growing treasury of its past. I hope these glimpses make you want to read more. I think it is a terrific and thought-provoking book and I can’t wait to talk with people about it. I hope to develop some sort of online presence for this study, but I don’t yet know what, when, or where (but other than that, it’s totally ready to go…). We’re holding the session of the study that begins tonight at a Panera bread near the church. That’s new for us, holding a study off site. As with most any new venture, I’m a bit nervous. There are so many variables out of our control! But I really think meeting in a different place will allow us to see and hear ideas that we cannot in the familiar comfort of our church building. A few other videos like the one above, with McLaren walking and talking. A Facebook community for groups using the book. Learn more about McLaren, or read his blog. Have you read the book? Let me know what you think? How are you celebrating Lent? Giving something up? Taking something on? Something else? 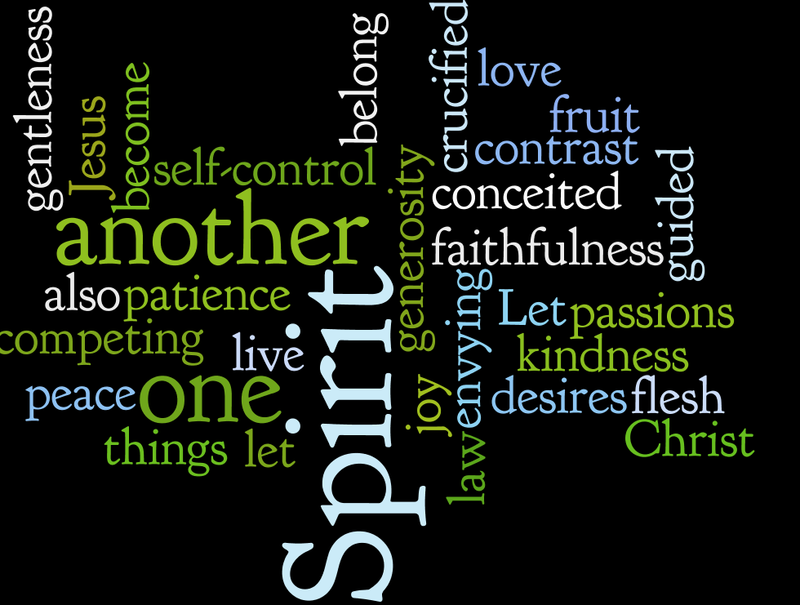 Galatians 5:13-16, 22-26 is my text, focusing especially on what Paul calls the fruit of the Spirit. Redefining Liturgy, part 2 (working title: Altering Altar to Table) drops on Sunday at Woodridge UMC. But our President gave a terrific speech. When I talk about giving every American a fair shot at opportunity, it’s because I believe that when a young person can afford a college education, or someone who’s been unemployed suddenly has a chance to retrain for a job and regain that sense of dignity and pride, and contributing to the community as well as supporting their families — that helps us all prosper. My friend, Brain McLaren offers cogent analysis of the speech and of the man. (“My friend” McLaren? I’ve met him three or four times and had meaningful conversation with him, but I doubt he’d remember me.) I voted for Barack Obama in 2008 (even campaigned for him a wee bit), and I’ll vote for him again this November. That doesn’t mean I’m not disappointed in some things the President has done – and some he has left undone. Guantanamo Bay chief among them. Mr. President, why the #$*^ haven’t you closed the gulag that is Guantanamo Bay yet?!? But, as his speech today demonstrated, he is a good man and he cares about people on the margins – which is exactly one of the main roles the government must play. Contrast that with Mitt Romney’s attitude toward the poor. Anyway, watch (or just read) President Obama’s remarks then let me know what you thought of the speech. THE PRESIDENT: Thank you. Please, please, everybody have a seat. Well, good morning, everybody. It is good to be with so many friends united in prayer. And I begin by giving all praise and honor to God for bringing us together here today. I want to thank our co-chairs Mark and Jeff; to my dear friend, the guy who always has my back, Vice President Biden. (Applause.) All the members of Congress –- Joe deserves a hand –- all the members of Congress and my Cabinet who are here today; all the distinguished guests who’ve traveled a long way to be part of this. I’m not going to be as funny as Eric — (laughter) — but I’m grateful that he shared his message with us. Michelle and I feel truly blessed to be here. This is my third year coming to this prayer breakfast as President. As Jeff mentioned, before that, I came as senator. I have to say, it’s easier coming as President. (Laughter.) I don’t have to get here quite as early. But it’s always been an opportunity that I’ve cherished. And it’s a chance to step back for a moment, for us to come together as brothers and sisters and seek God’s face together. At a time when it’s easy to lose ourselves in the rush and clamor of our own lives, or get caught up in the noise and rancor that too often passes as politics today, these moments of prayer slow us down. They humble us. They remind us that no matter how much responsibility we have, how fancy our titles, how much power we think we hold, we are imperfect vessels. We can all benefit from turning to our Creator, listening to Him. Avoiding phony religiosity, listening to Him. This is especially important right now, when we’re facing some big challenges as a nation. Our economy is making progress as we recover from the worst crisis in three generations, but far too many families are still struggling to find work or make the mortgage, pay for college, or, in some cases, even buy food. Our men and women in uniform have made us safer and more secure, and we were eternally grateful to them, but war and suffering and hardship still remain in too many corners of the globe. And a lot of those men and women who we celebrate on Veterans Day and Memorial Day come back and find that, when it comes to finding a job or getting the kind of care that they need, we’re not always there the way we need to be. It’s absolutely true that meeting these challenges requires sound decision-making, requires smart policies. We know that part of living in a pluralistic society means that our personal religious beliefs alone can’t dictate our response to every challenge we face. But in my moments of prayer, I’m reminded that faith and values play an enormous role in motivating us to solve some of our most urgent problems, in keeping us going when we suffer setbacks, and opening our minds and our hearts to the needs of others. We can’t leave our values at the door. If we leave our values at the door, we abandon much of the moral glue that has held our nation together for centuries, and allowed us to become somewhat more perfect a union. Frederick Douglass, Abraham Lincoln, Jane Addams, Martin Luther King, Jr., Dorothy Day, Abraham Heschel — the majority of great reformers in American history did their work not just because it was sound policy, or they had done good analysis, or understood how to exercise good politics, but because their faith and their values dictated it, and called for bold action — sometimes in the face of indifference, sometimes in the face of resistance. This is no different today for millions of Americans, and it’s certainly not for me. I wake up each morning and I say a brief prayer, and I spend a little time in scripture and devotion. And from time to time, friends of mine, some of who are here today, friends like Joel Hunter or T.D. Jakes, will come by the Oval Office or they’ll call on the phone or they’ll send me a email, and we’ll pray together, and they’ll pray for me and my family, and for our country. But I don’t stop there. I’d be remiss if I stopped there; if my values were limited to personal moments of prayer or private conversations with pastors or friends. So instead, I must try — imperfectly, but I must try — to make sure those values motivate me as one leader of this great nation. And so when I talk about our financial institutions playing by the same rules as folks on Main Street, when I talk about making sure insurance companies aren’t discriminating against those who are already sick, or making sure that unscrupulous lenders aren’t taking advantage of the most vulnerable among us, I do so because I genuinely believe it will make the economy stronger for everybody. But I also do it because I know that far too many neighbors in our country have been hurt and treated unfairly over the last few years, and I believe in God’s command to “love thy neighbor as thyself.” I know the version of that Golden Rule is found in every major religion and every set of beliefs -– from Hinduism to Islam to Judaism to the writings of Plato. But each and every day, for many in this room, the biblical injunctions are not just words, they are also deeds. Every single day, in different ways, so many of you are living out your faith in service to others. Just last month, it was inspiring to see thousands of young Christians filling the Georgia Dome at the Passion Conference, to worship the God who sets the captives free and work to end modern slavery. Since we’ve expanded and strengthened the White House faith-based initiative, we’ve partnered with Catholic Charities to help Americans who are struggling with poverty; worked with organizations like World Vision and American Jewish World Service and Islamic Relief to bring hope to those suffering around the world. Colleges across the country have answered our Interfaith Campus Challenge, and students are joined together across religious lines in service to others. From promoting responsible fatherhood to strengthening adoption, from helping people find jobs to serving our veterans, we’re linking arms with faith-based groups all across the country. I think we all understand that these values cannot truly find voice in our politics and our policies unless they find a place in our hearts. The Bible teaches us to “be doers of the word and not merely hearers.” We’re required to have a living, breathing, active faith in our own lives. And each of us is called on to give something of ourselves for the betterment of others — and to live the truth of our faith not just with words, but with deeds. So even as we join the great debates of our age — how we best put people back to work, how we ensure opportunity for every child, the role of government in protecting this extraordinary planet that God has made for us, how we lessen the occasions of war — even as we debate these great issues, we must be reminded of the difference that we can make each day in our small interactions, in our personal lives. Mark read a letter from Billy Graham, and it took me back to one of the great honors of my life, which was visiting Reverend Graham at his mountaintop retreat in North Carolina, when I was on vacation with my family at a hotel not far away. And I can still remember winding up the path up a mountain to his home. Ninety-one years old at the time, facing various health challenges, he welcomed me as he would welcome a family member or a close friend. This man who had prayed great prayers that inspired a nation, this man who seemed larger than life, greeted me and was as kind and as gentle as could be. And we had a wonderful conversation. Before I left, Reverend Graham started praying for me, as he had prayed for so many Presidents before me. And when he finished praying, I felt the urge to pray for him. I didn’t really know what to say. What do you pray for when it comes to the man who has prayed for so many? But like that verse in Romans, the Holy Spirit interceded when I didn’t know quite what to say. And so I prayed — briefly, but I prayed from the heart. I don’t have the intellectual capacity or the lung capacity of some of my great preacher friends here that have prayed for a long time. (Laughter.) But I prayed. And we ended with an embrace and a warm goodbye. And I thought about that moment all the way down the mountain, and I’ve thought about it in the many days since. Because I thought about my own spiritual journey –- growing up in a household that wasn’t particularly religious; going through my own period of doubt and confusion; finding Christ when I wasn’t even looking for him so many years ago; possessing so many shortcomings that have been overcome by the simple grace of God. And the fact that I would ever be on top of a mountain, saying a prayer for Billy Graham –- a man whose faith had changed the world and that had sustained him through triumphs and tragedies, and movements and milestones –- that simple fact humbled me to my core. I have fallen on my knees with great regularity since that moment — asking God for guidance not just in my personal life and my Christian walk, but in the life of this nation and in the values that hold us together and keep us strong. I know that He will guide us. He always has, and He always will. And I pray his richest blessings on each of you in the days ahead.